It’s something very special when one of your favourite class act brands announces the launch of a perfume collection in conjunction with Harrods. Masters of Spanish sophistication and supple luxurious leather, Loewe, have done just that – La Coleccion by Loewe is a high density perfume de luxe onslaught of four fragrances especially created to reflect the elegant luxury of the Madrid house. 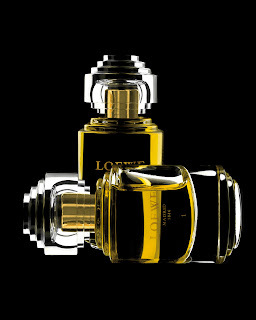 Created by Loewe’s in-house designer Emilio Valeros, in conjunction with the specialists at Harrods, these perfumes create a marking point in ‘how to do classic luxury without selling out a brand‘. Since the brand was launched in 1846, four generations of highly skilled creatives and designers have worked at making Loewe a name to be revered. 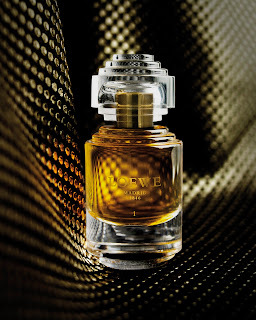 Thus, the four fragrances pay hommage to Loewe’s fine heritage through their beguiling sensuality and highly intense ingredients. The design of the bottles is equally as important to a brand that wants to relay classic elegance and style, the Art Deco rounded yet weighty style is subtle, clean and distinctive – no frills, just sheer statement classicism. A form that sublimates luxury encased in golden hued gift type case that unfolds and releases the fragrance on unwrapping, designed by creative director, Stuart Vevers. 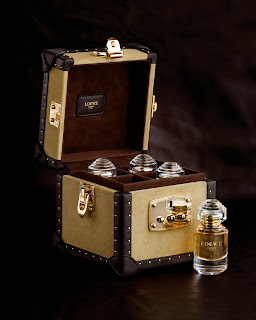 The uber wealthy can even order up a limited edition Suede-Gold vanity case that contains all four fragrances. Priced at £3,500 from Harrods this is no light buy but a favoured choice of golden liquids that promise the earth and deliver Heaven. Numbered 1 to 4, each with an underlying story and representative emotion attributed to them, the first thing that appealed, as well as the overwhelming sense of richness, was the ease of recognition. Each perfume is distinctive with it’s own character and personality that comes through, even on first application. 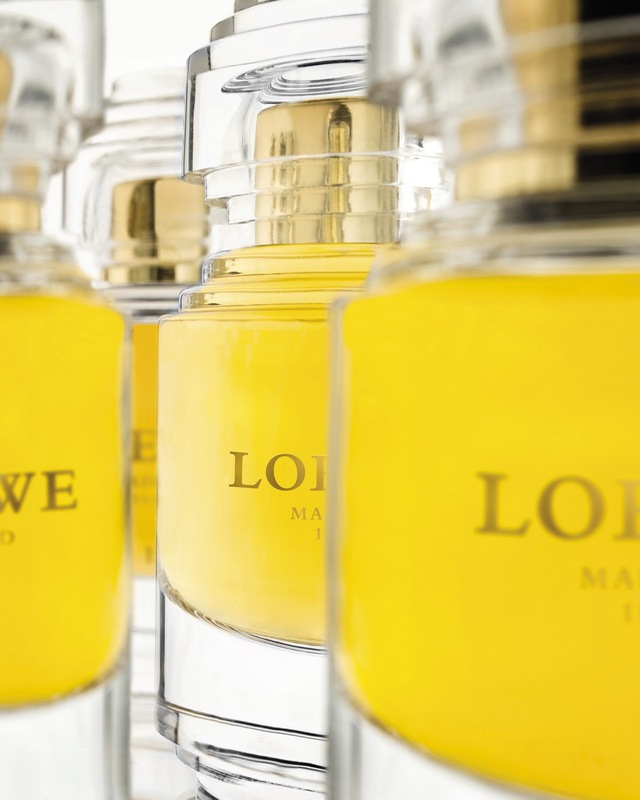 Not for Loewe the over complicated naming process and navel gazing of earnestly trying to be ‘different’. Loewe’s breathe and touch comes through easily – why make it complicated when it can be oh, so simple? Loewe 1 – Passion is meant to capture the need to live with passion, at the crux of Spanish life. On first wearing, it’s ladylike and light and is perfect for daytime wear, similar to Caron’s great 1930’s Fleurs de Rocaille. A profusion of uplifting Bulgarian rose and meadow type flowers in full bloom implode upon the wearer, with the sharp tinge of orangeflower and dry Mysore sandalwood to anchor the florals and to provide a rich depth to the fragrance. Wearing this scent, one’s instantly transported to Leonard Bernstein & Stephen Sondheim’s ‘West Side Story’. It’s very much ‘pretty witty and gay’ with the furore and pretty passion of a Latina lovely. No 1 straddles ‘West Side Story’s’ Maria in all her 1950’s Technicolour glory with a dash of mature, refined European socialite. 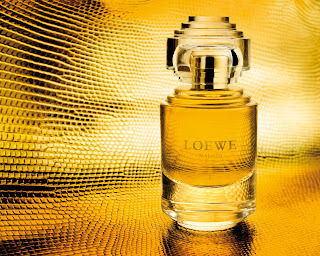 Loewe 2 has Sensuality as it’s key emotion. Sensuous jasmine and sandalwood come through but it’s the first grab of sharp purple redcurrant and Calabrian lemon that’s noticed. 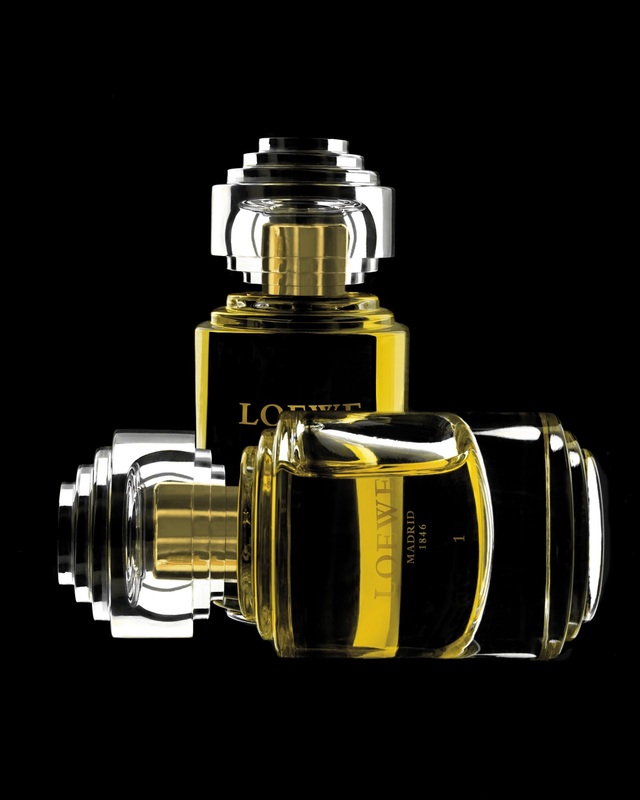 This has classic 1950s fragrance written all over it and has the hallmarks of longevity like Loewe 3 Desire, with it’s sophisticated complex approach. Dense iris seduces with bergamot hints. Seductive and sensual, No 3 is not for the faint hearted nor for those who like the obvious. Like all good iris fragrances (Hermes Hiris and Serge Lutens Iris Silver Mist), the heaviness intoxicates and beguiles. This is a head turningly gorgeous choice for a European woman of mystery who knows herself and where she is in life. Gone is the first rush of youth as well as insecurities replaced with focus, defiant, daring and deadly. No 3 – Desire’s polished fingertips have you in her grip. Loewe 4 – Eternity is like being wrapped in a beautiful, comforting cashmere wrap. The most approachable of the quartet, it has a soft, sweet, seductive technique. Creamy vanilla and heady Jasmine and Ylang Ylang soak the wearer up in sultriness and while heavy in make-up, are light and classic enough for everyday wear. The rush of oriental sweetness is controlled and mature, not cloying or over indulgent but still, a little goes a long way. The most appealing in that it’s rounded and ‘safe’ with it’s only downside being the use of ‘Eternity’ in its emotive description, which is synonymous with American house, Calvin Klein. Like a work of art, Loewe 4 – Eternity is a tiny paradise of intact essence. These are distinctly and overwhelmingly perfumes that are European in feel. They imbue a knowningness on the wearer, evoking a cosmopolitan woman who meets and mingles, crossing borders with style and intellect. Like the women they’re meant for, these perfumes have a maturity and outlook that lends them a broader viewpoint. Well read, well heeled and well bred, these new releases from Loewe show how to make a impact. 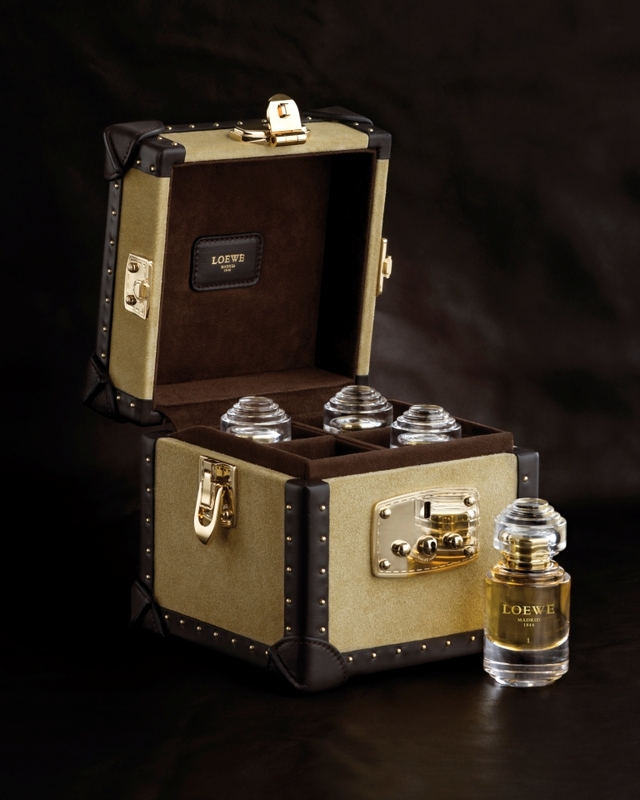 Loewe La Coleccion fragrances are available exclusively through Harrods, priced at £190 each. To comment on this review, please leave a comment in the box below. Thank you.